They caused such a reaction last year that we had to have them back…… plus it was these guys that made the fab video for us. After blowing the barn doors off last year Dead Happy make their triumphant return this year to the headline slot in the Barn on Saturday night! The electronic trio are appearing at several festivals this year including Boomtown Fair, Bearded Theory and of course Festival8 to name a few. Their brand of Freaky Disco Metal can best be described as a cross between Electric Six and System Of A Down and the band will in fact be recording a song with Electric Six later in the year. 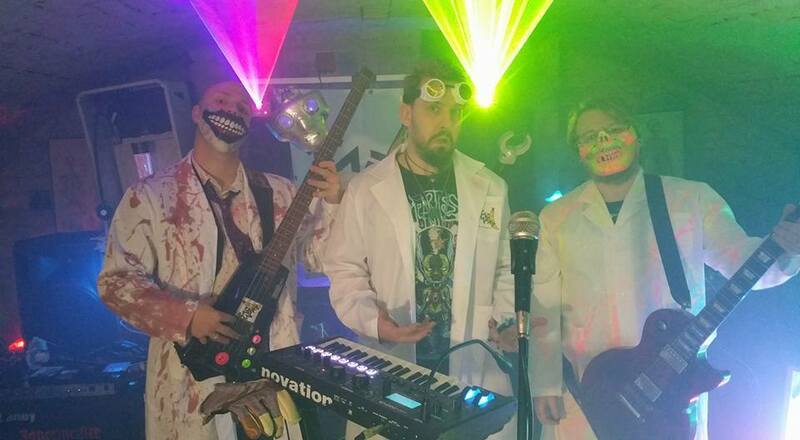 Dead Happy are a real treat to see live with their eccentric lead singer, UV wheelchair guitarist and introducing their Hippy scientist Bassist, Dead Happy really give it their all on stage along with lasers, bananas and volcanoes! it’s set to be one insane night not to be missed!